iradiophilly | Culture - Philadelphia Folk Festival Rebroadcast Weekend 2014, October 17-19, on iradiophilly! 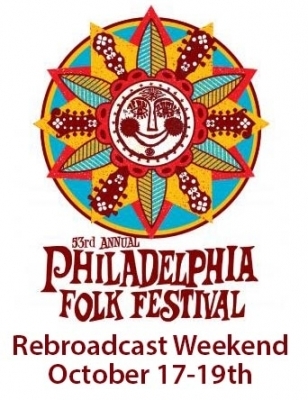 Philadelphia Folk Festival Rebroadcast Weekend 2014, October 17-19, on iradiophilly! iradiophilly was proud to broadcast the 53rd Annual Philadelphia Folk Fest LIVE from the Old Pool Farm near Schwenksville, PA this past summer. We brought you all the music from the Main Stage Friday, Saturday, and Sunday plus more such as interviews, past performances, etc. Now for the third year in a row we are going to be rebroadcasting those three days of music during the weekend of October 17-19th. The music will start Friday, October 17th at 12:00am (Thursday at midnight). We'll play through all of the sets from Fri, Sat, and Sun in order. When we get to the end we'll do it again and again until the evening of Sunday October 20th. Get ready to relive some of the magic from the farm again this weekend. In addition to the music we have some great interviews and other special treats between the sets. Happy Fest!